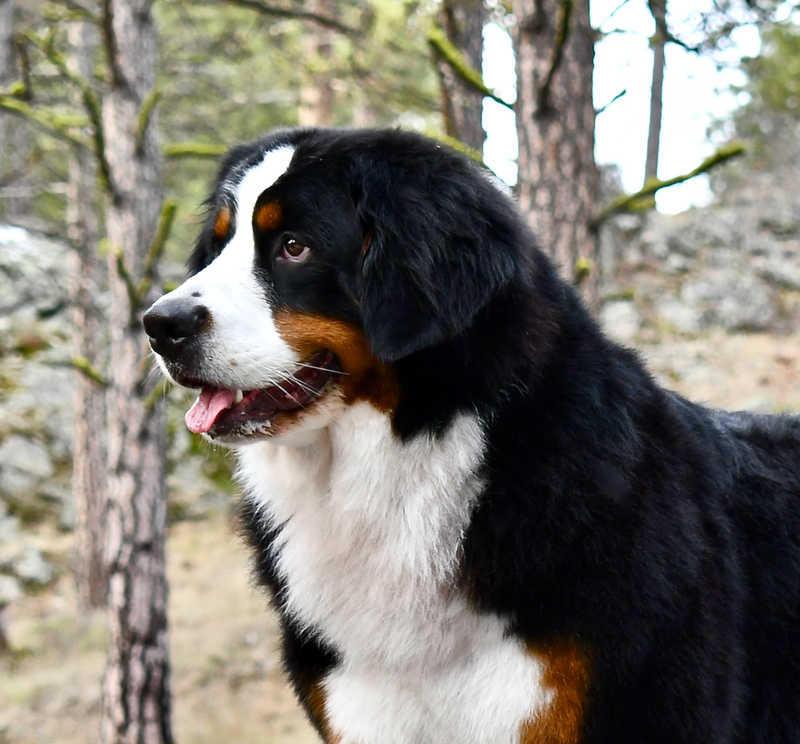 The demand for Bernese Mountain Dogs has created a staggering and discouraging array of disreputable breeders producing puppies to generate revenue. They use slick websites and clever marketing to disguise the reality that the true nature of their dog business is Exploitation and Profit. Any family desiring a Bernese Mountain Dog deserves a thoughtfully-bred puppy from an engaged, informed, and committed breeder. However, it can be difficult to separate reputable breeders from those exploiting the popularity of Berners for personal gain. No breeder can offer a guarantee of perfection — the nature of Life is, after all, Imperfection. But there are ways to stack the genetic deck, so to speak, in both positive ways and also in negative ways. To help Potential Puppy Owners begin to assess the genetic deck, we offer four minimum standards that can be used to evaluate both a breeder and a litter. Breeders who meet the following four minimum standards offer evidence that they are engaged members of the Breed Community, which increases the likelihood of both possession of — and access to — knowledge and expertise. Further, meeting these minimum standards reflects reasonable and informed attempts to breed healthy and sound Bernese Mountain Dogs. Finally, very few disreputable breeders and puppy mills can meet these four basic standards, thereby offering a screening tool for the ethical, informed puppy buyer. Note: Although developed for use in evaluating American breeders, these standards can easily be adapted for use in other countries; Berner-Garde is an international database. The breeder is a member of the Bernese Mountain Dog Club of America (BMDCA) and/or one of the BMDCA Regional Clubs. The parents and grandparents of the litter/puppy are in Berner-Garde. The parents (and optimally, the grandparents) of the litter/puppy have the health screenings recommended for the breed. The breeder uses Puppy Contracts and Limited Registration. Standard One: The breeder is a BMDCA member and/or a BMDCA Regional Club member. From Berner-Garde - note the available information. Search for the Breeder using the People tab on the Berner-Garde Database. Verify that the person is a BMDCA member by looking at BMDCA Status; if blank, that person is not a member. Regional club membership can be verified by contacting the Regional Club and/or checking their Membership Roster; click here to go to the BMDCA Regional Club page where all Regional Clubs can be accessed. Red Flags: Breeder is not in Berner-Garde. Breeder is not a BMDCA member or member of a BMDCA Regional Club. Standard Two: Parents and grandparents are in Berner-Garde. An example of a Berner-Garde page for an individual dog. Note the parents can also be viewed utilizing the Relatives tab. Obtain the registered names and AKC registration numbers for the parents of the litter/puppy. Search for each parent in the Berner-Garde Database using the Dogs tab. Click on the Relatives tab to ensure the dogs’ parents are also in Berner-Garde. Red Flags: The dogs are not in Berner-Garde. Their relatives are not in Berner-Garde. Recommended Health Screenings for Bernese Mountain Dogs. Standard Three: Parents have recommended health screenings. Click on the Certs/Tests tab in Berner-Garde for each parent dog to see their completed health screenings. Berner-Garde should have their health testing information but you can also check the database maintained by the Orthopedic Foundation for Animals just to be sure. This is easy peasy — just go the OFA website and enter the AKC Registration Number in the orange box at the top of the page. Red Flag: The parents of a litter or puppy do not have the recommended health screenings done. The breeder cannot provide verification of the health screening by one of the testing organizations or labs. Standard Four: Contract and Limited Registration. Ask to see the Breeder’s Puppy Contract. First, there should be a contract and second, expect the contract to say that the puppy will be sold on American Kennel Club (AKC) Limited Registration (Note: In some circumstances and with additional contract terms [often co-ownership], reputable breeders may sell a puppy on full registration). Red Flags: No contract. Puppy sold on Full Registration with no stipulations. The parents and grandparents and great-grandparents of every puppy deserve to have a wonderful life. Please do not support the misery that is puppy mills — if you do not want or need a thoughtfully-bred purebred puppy, please consider adopting your new canine family member from a rescue or shelter.